Corporation Beach, Corporation Road, East Dennis: Corporation Beach has lifeguards, a concession stand, restrooms, showers, and even a swing set for children set on a bluff overlooking the bay. Ezra Baker School, Route 28, West Dennis: playground with swings. Johnny Kelley Recreation Area, Corner of Bob Crowell Road & Old Bass River Road, South Dennis: basketball and tennis courts, ball field, two playgrounds (small & large), Bocce courts, pickle-ball, handball court pavilion, public bathrooms, and Braille trail for the sight impaired. Mike Stacy Park, 29 Hall Street, Dennisport: playground with swings. Nathaniel Wixon Middle School, Route 134, South Dennis. Basketball court, tennis court and field. 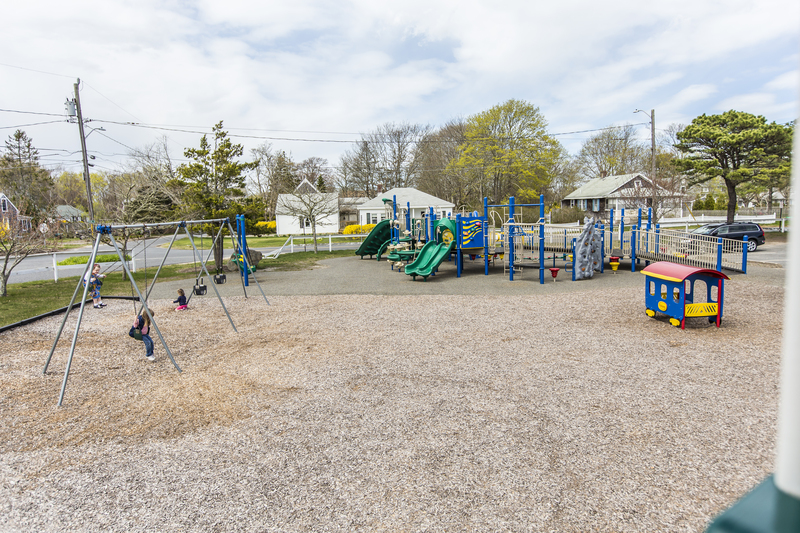 SeaView Park, Lower County Road, Dennisport: passive-recreation area with a playground, walking paths, community gardens, picnic tables, and a breathtaking view of Nantucket Sound. Village Improvement Society Playground, Route 6A, East Dennis. playground. West Dennis Beach: Families journey to West Dennis Beach in Dennis for kite-flying, sand castle-building, swings and aquatic games; college students play volleyball, and local adults swim in the warm water. At the beach is the Old Bass River lighthouse. A well-equipped snack bar concession, restrooms, and showers provide all the comforts while 10 lifeguard stations make this a safe, secure haven. West Dennis Graded School House, School Street, West Dennis. full playground with two level swing set, two obstacle course with slides, climbing wall, etc., handicapped accessible.